Hey there, my name is Wasabi and I was born July 4th, 2004 at Blue Cedar Kennels in Nevada. 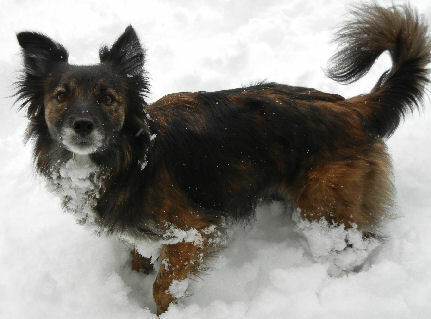 My mix is 1/2 border collie, 1/4 staffordshire bull terrier, 1/8 border terrier and 1/8 jack russell. 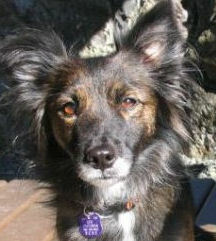 I spent some time in Florida, but in April 2009 I came to Victoria BC to live closer to my litter-brother Chum. My humans are Shawna and Michael, and I live with my canine brother Odo, and felines Smokey and Ginger. It was a given that I would play flyball when I joined Total Anarchy, but Mom still had a few bugs to work out in my training. I didn't like dropping my ball for the tuggy, so we worked through that, but my biggest success has to be learning to "find the jump" so that now I can bobble WAY off course and still come back over all the jumps! My average time in the pack is around 4.8 seconds, and my best time in start position has been 4.34. A little about my personal life: My favourite tricks are roll over and crawl. My favourite toys are the ball and my Nylabone. My favourite place in the house is the black chair. It doesn't matter where Mom & Dad move it, that is where you will find me!